I first came to Boston almost 40 years ago, then again the best part of a decade ago, when I simply walked from the North Station to the South Station – so it was good to stop over for a couple of nights and have a proper look around. In particular I wanted to visit a friend at MIT and to visit the new Harvard Art Museums (where a scheme by Renzo Piano in 2014 united the previously separate Fogg, Busch-Reisinger and Sackler Museums). 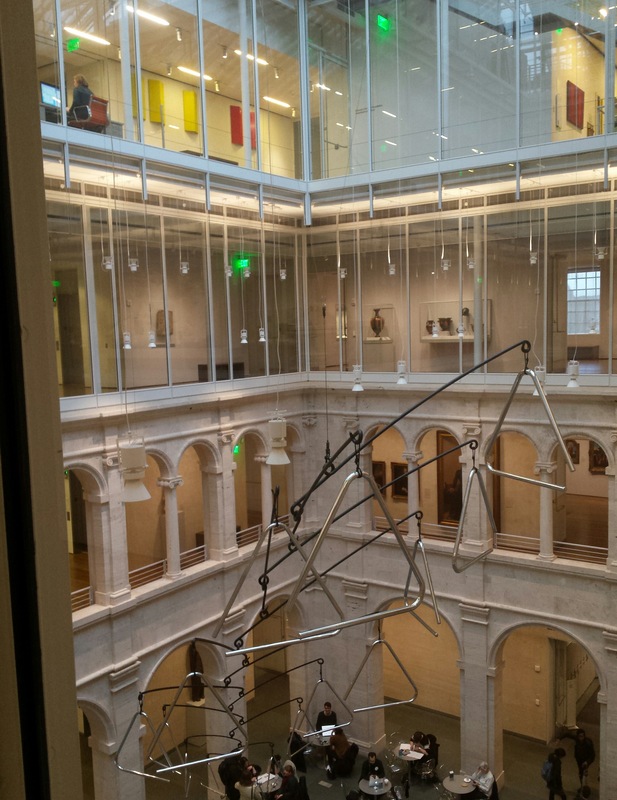 This post will mainly be about Boston’s museums and public transport (so what’s new?). 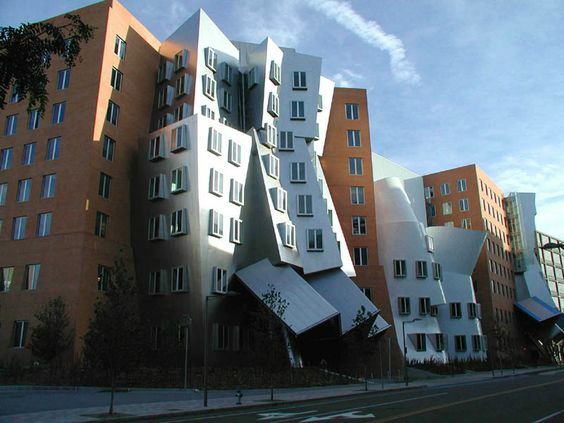 Boston is often thought of as the most colonial of American cities (though I’d say that Philadelphia – and indeed Québec City – run it close), and also as a hard city full of boozey Irish, but nowadays it’s stuffed with high-powered academic – Harvard, MIT, Boston University, Tufts, Northeastern, UMass etc – and medical institutes – Mass Gen, Brigham & Women’s, Boston Children’s, Boston Medical Center, Dana-Farber Cancer Institute etc, which seem to be competing with each other for massive philanthropic gifts. It’s not Silicon Valley but it’s just as impressive. Bill Gates and Mark Zuckerberg were both Harvard drop-outs, of course. If the downtown area, between the North and South stations, is the equivalent of the City of London, with skyscraper banks, historic buildings and a chaotic streetplan, then Copley Square and beyond is Kensington – more regular, with parks and museums – and between them Chinatown and Theatreland are like Soho, along with Boston Common, in some ways equivalent to Hyde Park. Crossing the Charles River from downtown Boston to Cambridge (Massachusetts – not the Cambridge I live in) you come first to MIT, which turned out to be rather older than I thought, dating from 1861. Originally in Back Bay, the reclaimed land on the Boston side of the river, it moved to Cambridge in 1916. It’s always been renowned, but it’s its computer-based research that has really boosted it into the stratosphere, with the AI Lab (since 1959, amazingly) and the Media Lab (founded in 1985) leading the way. The MIT Museum doesn’t cover the whole story but homes in on specific projects such as COG and Haptics (both aspects of advanced robotics); it also holds the collection of the New York Museum of Holography (which closed in 1992), but I was struck especially by a map of Boston in 1630, with a shoreline scarily close to a projection for 2100, ie with the reclaimed areas re-reclaimed by a rising sea. There’s also a hotch-potch of high-tech new buildings here, by architects such as Alvar Aalto, Eero Saarinen, IM Pei and Frank Gehry. Continuing along Mass Ave (Massachusetts Avenue, of course) you come to Harvard Square and the little-known university of the same name, founded in 1636 and now consistently ranked as the world’s best – it’s also the best funded, with an endowment of US$34.5 billion, so deserving students study for free. It’s also increasingly expanding into Allston, just across the Charles River to the south. 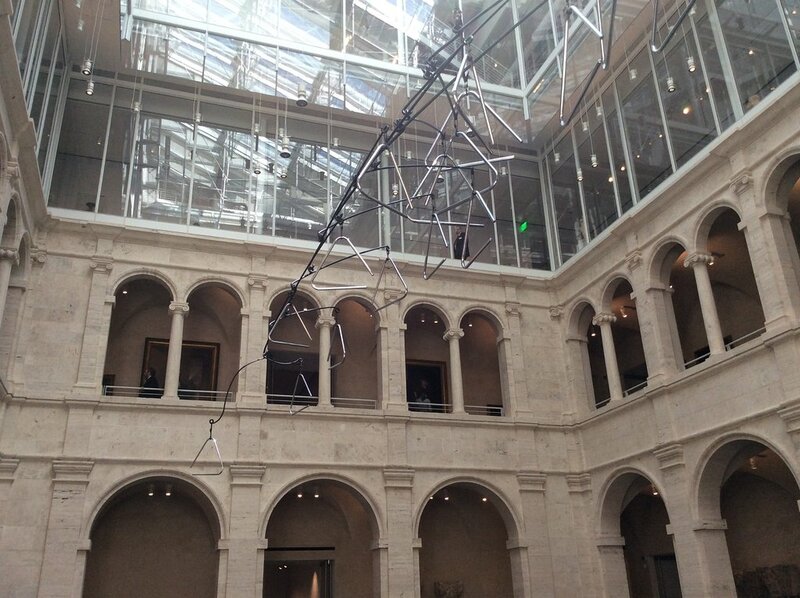 I’ll add my thoughts on the Harvard Art Museums at the end, I think, but I do recommend them. The Harvard Museum of Natural History is pretty amazing too. In Fenway, beyond Copley Square and Northeastern University are the Museum of Fine Arts (which I didn’t revisit, it requires at least half a day – but I did see their famous Cézanne portrait of his wife in London anyway a few weeks later) and the Isabella Stewart Gardner Museum, which I hadn’t visited before. It has some wonderful works of art, but I found it a bit annoying – dark, without captions (there are information sheets for each room) and cluttered with decorative arts trinkets and minor works of art that give a sense of Europe having been plundered by the new American tycoons. It also has an expensive but fairly pointless new extension. Gardner did have good taste, though, and was a friend of Whistler and Henry James, and especially of John Singer Sargent – there’s plenty of his work here (and at Harvard), not just portraits but also some landscapes. Oddly enough, it turns out that Sargent is buried in Brookwood Cemetery in Woking, which I mentioned in my last post. The MFA opened the new Art of the Americas Wing in 2010 and the Linde Family Wing for Contemporary Art in 2011; they’ve just been given two more collections of 17th-century Dutch and Flemish art and announced a US$24m project to create more galleries and a Conservation Center. No doubt I’ll get there next time I pass through. One other art museum that was recommended to me was the Institute of Contemporary Art, which had a prestigious history as the Boston offshoot of New York’s MOMA and has greatly expanded its activities since moving to its striking new waterfront building in the Seaport in 2006. This summer (2018) the ICA will open the Watershed, a free summer-only satellite in a former copper pipe factory in the East Boston Shipyard, which will be reached by boat from near the ICA. Boston’s Irish and liberal-intellectual traditions come together in a left-leaning political tradition, and above all in the person of John F Kennedy, whose presidential library and museum (another striking waterfront building, this one by IM Pei) opened in 1979 a couple of miles south of the city centre (there’s a free shuttle bus from the JFK/UMass station on the Red Line). 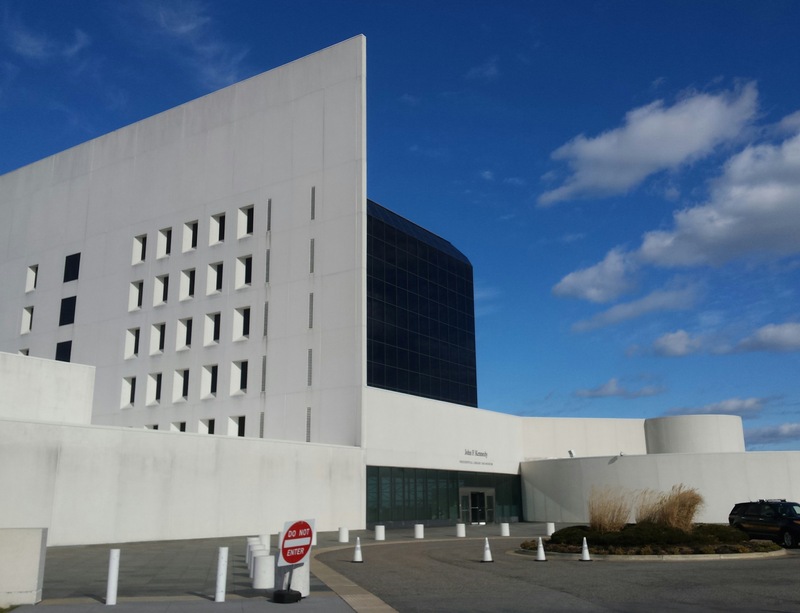 The museum is of course well presented and offers plenty of insights even if you think you know about JFK already. Of course he had a privileged upbringing, touring Europe and helping out at the US embassy in Paris while his father was ambassador in London, but while his father was tolerant of Hitler JFK took both the Nazi and Soviet threats very seriously. He’d grown up in and on the water and was on the Harvard swim team, so when his motor torpedo boat was rammed and sunk in the Pacific he was able to swim over three miles towing an injured crewman with his life-jacket strap between his teeth; he then led his crew from island to island for six days before meeting two natives in a canoe who took a message carved on a coconut (which is here in the museum) to get help. He came home with malaria and a bad back and, although he had been thinking of teaching as a career, went into politics in place of his older brother who had died when his bomber exploded over Suffolk. As president he remained focussed to a surprising degree on foreign affairs (the Civil Rights agenda was managed by his brother Bobby, the Attorney-General). Wisely, I think, the museum doesn’t touch upon JFK’s assassination. I was reminded how we feared for Obama when he was first elected – there was no need, as it turned out, but with hindsight we can see how thoroughly he fitted the JFK mould of seeking office in order to serve and make the world a better place, and his successor rather less so. Boston’s public transport system, run by the MBTA (known as the T), is a bit of a mess – yes, it looks good on paper, or on a map, with subway and ‘commuter rail’ lines covering a wide area, but timetabling and ticketing are very poor, and the trains are old and unattractive. The subway provides a decent all-day service, but the overground trains basically run into the city in the mornings and out in the afternoons (although other American cities are far more extreme cases) with virtually no service in the evenings or at weekends. Modern cities need frequent services all day every day, and not just to the central business district. They also need a fare system that encourages multiple trips and off-peak travel – in Boston a single ticket costs $2.25-2..75 and a day pass costs a stonking $12, which is basically telling people they’re not wanted beyond the basic commute. A day pass should cost little more than two singles. As so often in the US, ticket machines don’t accept non-American cards, but they did take my dollar bills, which isn’t always the case. But this is the city that spent $14.6 billion (almost double the budget) on the Big Dig, a project from 1991 to 2006 to put I-93, the Interstate highway through the heart of Boston, into a tunnel, and didn’t even manage to put a cycleway on top where the highway used to be. Instead there’s a dual carriageway and a linear park, the Rose Fitzgerald Kennedy Greenway, with a path and signs telling cyclists to use the on-road lanes. Yes, painted lines are good enough to protect cyclists here. That does absolutely nothing to get people out of their cars. I’m not even sure the authorities want to – maybe the Democrat machine here is like Old Labour in the UK and hasn’t quite embraced alternative ways of getting around yet. At least it’s easy to get to the airport – in addition to the free shuttle bus from the Airport subway station, there’s also the relatively new Silver Line bus (SL1) through the new tunnel from South Station (which charges a standard subway fare), and the Airport Shuttle from Copley Square, clearly aimed at tourists (but payment can only be made by credit card so that it’ll end up costing close to US$9 for foreigners once bank fees are added in). I stayed at the HI hostel which is clean, central, friendly and well organised, and fairly sustainability-minded – except that it was over-heated. Like all hostels nowadays, people don’t talk, they just spend their time on their laptop or phone. As seems to be the way nowadays, Renzo Piano’s transformation of the Harvard Art Museums involved turning an open courtyard into a glass-roofed atrium, with de rigueur café, as well as adding a new wing to the east, on Prescott St. Oddly, as my very last post was about the Lightbox Gallery in Woking (England), he added a ‘lightbox gallery’ at the top, looking down into the atrium, with exhibits exploring the intersections of art and technology (the whole collection is digitised, and you can use an interactive floorplan on your phone). To me it seems very successful, and the displays are certainly wonderful. Start in room 1220 on the ground floor with the Wertheim Collection, Impressionist and PostImpressionist works donated on condition they’re displayed together in one room – there are pieces by Manet (a fine self-portrait), Monet, Renoir, Pissarro, Degas, Toulouse-Lautrec, Dufy, Bonnard, Van Gogh, Matisse, Gauguin, Cézanne, Seurat, Maillol, Rousseau, and three Blue period Picassos. In general the museum’s captions are excellent, but I was taken aback by the claim that Pissarro was Danish – it turns out he was born to French parents in the Danish West Indies (now the US Virgin Islands) but there was nothing Danish about him. This seems odd because as a rule in the US it doesn’t matter where an artist was born, if they ever reached the US they’re instantly listed as American. In the next rooms are four more Picassos, paintings by the likes of Braque, Feininger, Metzinger, Severini, Léger, Klee, de Kooning and O’Keeffe, three sculptures by Brâncusi and others by Henry Moore, Lynn Chadwick and Kenneth Armitage (all British). Then there’s Miró, Orozco, Siqueiros, Grosz, an early Liechtenstein (1953), Guston, Dubuffet, Calder (a combined mobile and stabile), Pollock, Rothko, Gorky, Stella, Nevelson, Albers, Ellsworth Kelley, Serra, Rauschenberg, Beuys, Nam June Paik, Baselitz, Ruscha, Neumann, Gordon Matta-Clark, Sol LeWitt, Gerhard Richter, Joseph Kosuth and Rachel Whiteread – a pretty solid coverage of twentieth-century American art, with a few outsiders. Also on the ground floor is a great collection of nineteenth- and twentieth-century German art (see my post on Berlin’s museums), plus a few Scandinavians, from Franz von Stuck through Corinth, Liebermann, Munch, Klimt, Pechstein, Heckel, Paula Modersohn-Becker, Nolde, Kirchner, Schmidt-Rotluff, Moholy-Nagy, Mondrian, Klee, Ernst, Grosz, Beckmann (his Self-portrait in a Tuxedo, 1927), Kandinsky, Münter, Johannes Malzahn, von Jawlensky and Marc, to a bronze relief by Käthe Kollwitz and a chair by Marcel Breuer. Finally on the ground floor are three rooms of early Chinese and Buddha sculptures, including two sixth-century Buddhas and two from Gandhara, as well as Neolithic jades, bronzes and Tang figures. After taking the lift up to the Lightbox I went down to the third-floor gallery, where there are ancient treasures such as Assyrian and Persian reliefs (don’t miss Ahuramazda in the Winged Disk, 486-460 BC), superb Greek ceramics (including the ‘Berlin Painter’, who I missed when I was actually in Berlin), Roman glass and sculptures, Greco-Roman funerary portraits, Palmyran funerary heads and Egyptian bronzes, ceramics and (from the Byzantine period) tapestry. The largely European displays on the second floor have a good selection from the early Italian Renaissance (but much less from the later Renaissance), with Bernardo Daddi, Taddeo di Bartolo, Cosme Tura, Matteo di Giovanni, Fra Angelico, both Ambrogio and Pietro Lorenzetti, Simone Martini, the workshop of Botticelli (there are lots here by ‘workshop of’, ‘after’, or anonymous ‘ Master of …’ – but they’re all very good), the circle of Giovanni Bellini, Ghirlandaio, Lorenzo Lotto, Tintoretto and the Master of the Fogg Pieta (c1330). From Northern Europe there’s a portrait of Luther by the older Cranach, then in the 17th- to 19th-century galleries works by Rubens, Jacob van Ruisdael, van Goyen, Philips Wouwermann, David Teniers II and Rembrandt, then Ribera, Orazio Gentileschi, Canaletto, Tiepolo and Guardi, and a swathe of French art by Poussin, Fragonard, Boucher, Greuze, David, lots by Ingres (including a self-portrait), Géricault, Delacroix, Courbet, Corot, Moreau, Chassériau, Redon, Monet, Cézanne, and Renoir (not fluffy soft-focus ones like on the ground floor – am I the only person who hates those?). There are also works by the American Mary Cassatt and the Belgian Alfred Stevens, both based in Paris, and three by Degas of New Orleans, where he visited family in 1872-3. The American section starts with portraits by John Singleton Copley (of John Adams), Gilbert Stuart (of John Quincey Adams) and Charles Willson Peale (of George Washington in 1784), as well as his niece Sarah Miriam Peale (1800-85). Copley was the leading portrait painter in colonial Boston but moved to to London to escape the revolutionary turmoil – there are also three excellent big portraits by him of members of the Boylston family, and I couldn’t help noting that Copley and Boylston are both now Boston subway stops. There’s also a portrait of Washington (c1795-6) by Stuart, who painted a series of iconic portraits of the first president and, with his daughters, 130 copies of them – but this is one of the best. There are also works by Eakins, Bierstadt, Sargent (a landscape of the Simplon), Whistler, Winslow Homer and photos by Stieglitz, and British artists such as Lawrence (of the Persian ambassador to the court of George III), Holman Hunt, Ford Madox Brown, Rossetti, Watts, Bonington and Burne-Jones, and photos by Eadweard Muybridge. And finally, there’s more Asian art, with Islamic ceramics, Indian stone-carvings and paintings, Japanese scrolls and screen, Chinese ceramics and scholar’s rocks (a fascinating discovery), plus murals from the Dunhuang temples. All in all, the HAM is not as comprehensive as the MFA, but the twentieth-century collection in particular is excellent.